The kiddo and I spent the President's Day holiday in San Francisco with my in-laws, touring the Presido and talking about the soldiers who used to live there. Canons, barracks, munitions...everything is an army thing to this kid. At 6, he knows more about the military than I'll ever know about how to properly do laundry (sorry about that sweater, Max). 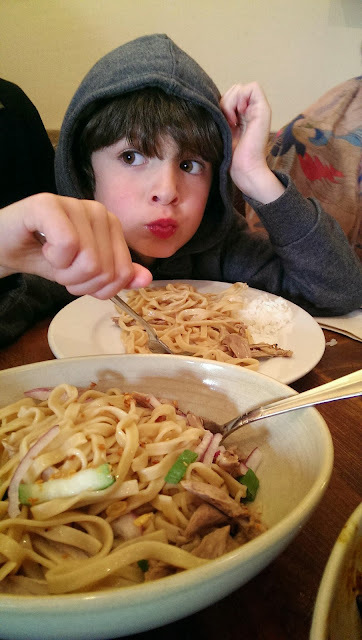 We had lunch at Burma Superstar in the Inner Richmond--noodles, noodles and more noodles. A fun, playful, delicious, beautiful day with great company. Hooray for presidents! It occurs to me that your kiddo would love the Nike Missile site in the Marin Headlands. What kid doesn't love Cold War history, right? Here's the link http://www.nps.gov/goga/nike-missile-site.htm It is TOTALLY worth going on the first Saturday of the month because men who used to work at these sites are there to show you how it all went down, PLUS you get to ride on the missile elevator, with a missile, down into the bunker with all of the other missiles. It. Is. Awesome!